Employees at CCP Games in Decatur, Ga. Photo provided by CCP Games. There’s a small army in Decatur working to create a world of darkness. The 100-person team is meticulous. They want their world to be perfect before they start drawing people in. The pressure is high. They have decades of fan expectations to live up to. Video game company CCP acquired Stone Mountain-based White Wolf Publishing in 2006 specifically for their World of Darkness property — a universe filled with modern-day vampires, werewolves and mages. White Wolf became part of CCP North America and is now housed in downtown Decatur, Ga., where programmers and designers are creating a massively multiplayer online game based on this world. Those who haven’t heard of White Wolf likely know some of the vampire mythology its books originated. The idea of vampires uniting into competing clans, for example, comes from the “Vampire: The Masquerade” series of tabletop roleplaying game books. Theron Thackery, office manager at CCP North America, is confident that if you have a vampire question, they have an answer. Monsters worlds are a bit of a departure from the norm for CCP. The Iceland-based company rose to fame with the release of “EVE Online,” a massively multiplayer online game where players take the role of spaceship captains. That game has about 500,000 monthly subscribers paying $15 a month to play. CCP recently announced a new game, “EVE: Valkyrie,” where players pilot their own dogfighter spaceships — think Star Wars’ X-Wings — by using a virtual reality headset. This home VR technology has been under development for PC gamers for a while, and Sony recently revealed they will release a VR headset of their own for the PlayStation 4. “EVE: Valkyrie” will be released alongside both. Thackery said this type of development requires top talent, and CCP is regularly trying to attract programmers to join its Decatur team. 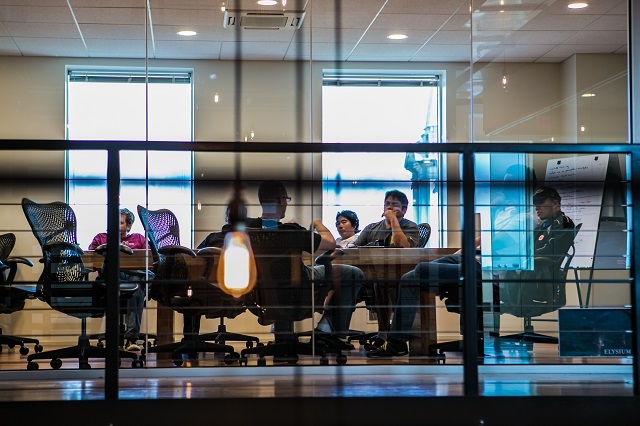 Several office and company perks likely contribute to that retention rate. The three floors of custom-built office space feature a gym, spacious offices and a massive kitchen where two full-time chefs cook daily breakfast and lunch. Thackery said their downtown Decatur location is also a bonus. Proximity to bars and restaurants encourage employees to hang out together after work. It’s unusual for a tech company like CCP to be base in Atlanta. Thackery said the region can sometimes help with recruiting and sometimes hurt. Those who get past the stereotypes see a lot of benefits, he said. Atlanta has a lower cost of living compared to traditional technology cities such as San Francisco, and programmers looking to buy a house and start a family find that attractive.